Bilingual artist book (hand made) comprising 62 haiku and tanka by JB ; concept and 17 illustrations by Claire Dufresne. Limited edition of eight copies numbered and signed by the artist and the poet. Copies in the Conservation Collection at the Bibliothèque & Archives nationales du Québec in Montréal and at Library & Archives Canada in Ottawa. Towards the end of November 2011, one may consult a copy of the book on site in the Diffusion Collection in the BAnQ in Montréal located at 2275 Holt Street. Direction of JB. Collection of 283 previously unpublished haiku and tercets by 86 French speaking women authors and of 14 illustrations by various women artists. A world-first because it is the only book giving voice to French haiku women poets. Topics: friendship, family, the passages of life, society, the future of the planet. A study by JB precedes the main body: Francophone et féminin, le haïku (Haiku, French and female) which is a brief history of haiku written in French by women since the beginning of the XXth century. The study ends by a proposition of androgynous writing. Web site of Publications Association francophone de Haïku and Diffusion Adage. The Author has recovered 100 % of her copyright. Co-direction by Janick Belleau and Micheline Beaudry. 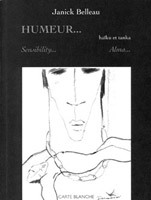 Collection of 77 French-speaking poets and 182 of their previously unpublished short poems; 9 illustrations by Line Michaud. A world-first: haiku in French, original language, perpetuating the traditional Japanese theme of eroticism. Finalist for the Belgian Literary Prize, The Salt of the Readership (Le Gros Sel du Public), an award granted to works to which traditional media pay little or no attention. 2003. Humeur… Sensibility… Alma… – haiku / tanka. Please, read the details in the Sappho section. Portrait of 12 women pioneers of haiku in Canada and their achievements: Simone Routier, Claire Pratt, Joan Giroux, Catherine M. Buckaway, Mildred A. Rose, L. Pearl Schuck, Betty Drevniok, Margaret Saunders, Jocelyne Villeneuve, Ruby Spriggs, Ava Kar (Anna Vakar), Dorothy Howard. Interview focusing on basic rules of haiku – rules formulated for teachers by the poetess in 1985 in her text « A Lesson Plan That Works » which appears in William J. Higginson’s book for which Harter collaborated: The Haiku Handbook. Does the poetess still follow these rules, a few decades later? Here is an interview that Ms Harter gave to Janick while in Québec City, Canada with William J. Higginson, in the Fall of 2006. To read, please click Interview with Penny Harter by Janick Belleau. This PDF is this writer's copy. JB, guest editor of the Section, Written in the feminine. Some definitions (haiku, senryu, tercet) and presentation of 6 women poets (isabel Asúnsolo, Blanca Baquero, Micheline Beaudry, Anne-Marie Labelle, Angèle Lux et Monika Thoma-Petit) and of some of their previously unpublished haiku; plus, 16 haiku by JB. Translation from French mainly by Jo-Anne Elder. Annual Weekend of Haiku Canada in Ottawa. Talk given to members of Modern Haiku Association in Tokyo, October 2013. Talk in English (translated from French by Maxianne Berger) followed by a Questions/Answers Period. Talk translated in Japanese by SAEKI Junko. JB's talk: Panorama of Haiku (1998-2009) - the vision of Francophone poets and thinkers in France (Alain Kervern, Maurice Coyaud, Corinne Atlan / Zéno Bianu, Jean Antonini, Dominique Chipot, isabel Asúnsolo / Éric Hellal); in Québec (Dorothy Howard, André Duhaime, Robert Melançon, Francine Chicoine); and in Belgium (Serge Tomé). Beginning of talk: I approach the state of contemporary haiku practically, letting Francophone poets and thinkers remind us of their vision. How> My method isn’t as exhaustive as that of other poets such as Andrea C. Missia and Max Verhart. Rather, I created a list from my personal library of anthologies and collective works published over the last ten years. I favoured the works introduced with a preface, a foreword or an introduction giving a short or long definition of haiku. They are authors or co-authors who have written these texts-definitions. Their words have been faithfully transcribed and objectively analyzed. Chronology is by year of publication. My paper flows as follows: first, I quote, in their own words, Francophone poets and thinkers who describe the characteristics of haiku according to their definition of it. Second, I clarify the words, phrases, snatches of sentences, if necessary, when there is a ‘yes’ in the appropriate column of the spreadsheet. The Spreadsheet: Eleven characteristics define haiku, beginning with the columns Poem, Brevity, etc. These are the words appearing regularly in the above-mentioned Prefaces. The characteristics are classified according to the form and content of haiku: the first five are the form, i.e. the structure; the last six are the content, i.e. the spirit. Abstract: Themes favoured by haiku women, whether they are French, English or Japanese, are recurrent. The talk concentrates on the intimate thoughts of Canadian women poets while being busy with everyday tasks. Haiku in French, read by Micheline Beaudry, Diane Descôteaux and Jessica Tremblay also present for the week end conference. Abstract: What are the characteristics of women’s writing? The most recurrent, those defined by Western women theorists since 1974, are examined: first person subject, one’s own body (often dealt with humour), the everyday, and the mother-daughter relationship. There are also newer themes of friendship, environment and society. Presentation concludes by submitting that the concept itself of women’s writing is constantly evolving, giving way in some instances, to androgynous writing. and Meiji University, Center for International Programs for Prof. Yoshikazu Obata ’s classroom (October 17). Deep bow to translator and poet (from English to Japanese), Ms Emiko Miyashita who also served as interpreter for the first two activities. NB: Heartfelt thanks to the 3 organisations and to A. F. to have paid most of my expense. Abstract: Some women pioneers devoted a great part of their creativity to writing haiku and to publishing their texts; others devoted their creative energy to promoting haiku by writing critical studies, publishing literary reviews, mentoring or being elected executives the national association, Haiku Canada.